The rest of the world may tuck itself indoors as temperatures fall, but not the people of the Kootenays. This region of British Columbia, belted by a thoroughfare named The Powder Highway embraces winter weather. The mountains powder themselves in crystalline white while inhabitants — both people and wildlife, bundle up with thicker coats. But unlike the mammals that burrow as daylight hours wane, Kootenay folks find ways to maximize shorter days and light up the longer nights. Rossland's Winter Carnival - Canada's longest running winter carnival (since 1898); photo by Steve Ogle. In towns across the Kootenays, you’ll find hardy outdoorsmen and women (and their children) stepping willingly into chilled air with their neighbours. Cheeks red, hands-mittened, the season is welcomed with winter carnivals, festivals, and the general shenanigans the Kootenay culture is known for. Santa might be busy getting presents to children around the world, but he makes two special appearances in Fairmont Hot Springs on Christmas - at a pancake breakfast with all invited, and at the Fairmont Hot Springs Resort’s torchlight parade and fireworks that evening. Those who celebrated through the winter night on Christmas Eve can take the chill off on Christmas day in the town’s hot spring waters; all that’s on the Christmas list for entrance that day is a donation to the local food bank. The pins — and the bail set to get pin-less attendees out of jail, raises money for a local charity each year. Those obediently displaying The Griz pin will find diverse activities to give a try: there’s mountain man-style competitions including sawing, shooting, axe throwing, fire starting, leg wrestling, hockey shoot out, and a pancake eating contest, along with fireworks, rail jams, and plenty more. Fire moves from ground to sky in this celebration of local creativity and winter. A bonfire is lit as the Snow King and Lady Spring—both giant-sized puppets come to life, move into the town’s ‘Spirit Square’. Fire dancers perform along with other larger-than-life characters who perform skits for the townspeople surrounding the hub. Drumming and music fuels dancing for both performers and spectators, building momentum until a finale of fireworks litters the sky. Photo courtesy of Kicking Horse Culture. Need some inspiration to get into the cold? Perhaps ice-skating or cross-country skiing on their Guinness World Record trail during Invermere’s winter festivals will get you motivated. “Our 34-km groomed trail around Windermere Lake, is the Guinness World Records as the longest skating trail,” says town spokesperson Ken Wilder, and many of the events during the Snowflake Festival are centred around this trail and the lake. If you’re needing more than skiing, Ken suggests jumping in a game of snow golf, taking part in the Pond Hockey Championships, or trying out bonspiel on the lake — all key happenings of the Snowflake Fest, part of the town’s 'Winter in Motion' season-long (Nov 29 to Mar 29) recognition of the season. After all that action, festival-goers will need refuelling. Lucky for them, the 'Taste of the Valley' culinary showcase is also a key part of the day’s festivities. Nelson’s Winter Kick-off Festival is back for another year to get you stoked for winter - in true Kootenay-style. 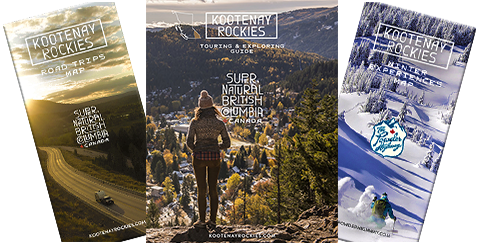 Find out why Nelson and the Kootenay Lake region loves winter. From live music performances to workshops and tours, come stay, play and find awesome! Wondering, who has the tastiest hot chocolate in town? Step into one of Nelson's participating cafes to sip and savour the various chocolatey creations. Voting is from Nov 22 to Dec 2: ready, set, start tastying! It’s a flurry of frozen H2O: There’s the homemade bobsled comp on a purposely iced-down (and steep) Spokane Street, dump trucks dropping loads of snow onto a second street for snow sliders and rail jams, and beverage bars made of solid ice for those who feel their participation is best lent as an onlooker. Words by Gina Begin. Cover/top shot by Steve Ogle at Rossland’s Winter Carnival.